This Amish rocker is made of environmentally friendly pressure-treated Southern Yellow Pine Wood and stainless steel screws to withstand years of outdoor use. 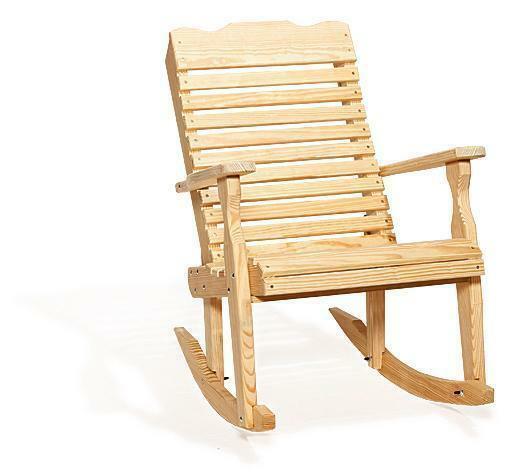 Rock your cares and worries away in this comfortable Amish handcrafted Patio Rocking Chair. The curved back offers plenty of support and comfort as you sit in this Amish rocking chair. This Curved Back Patio Rocking Chair is made in Lancaster Country, PA by an Old Order Amish woodworker. You can feel good about purchasing American made furniture that isn't imported. This Amish Rocking Chair is available unfinished or stained. We do recommend that you do apply some sort of outdoor water sealer on this furniture to protect from the elements. Please allow one to four weeks for this outdoor rocking chair to arrive. Call 1-866-272-6773 with any questions or to place your order over the phone with one of our Amish furniture specialists on our outdoor furniture.